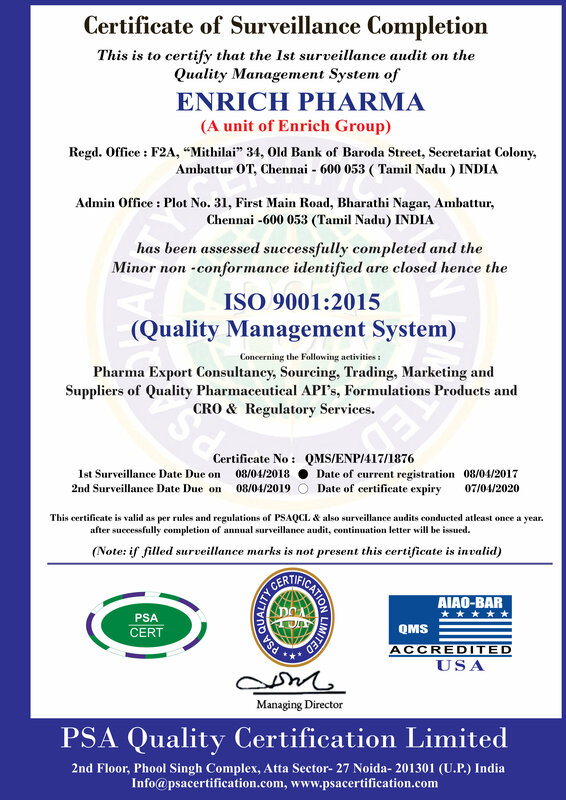 ENRICH PHARMA is a Chennai based International Pharmaceutical Consulting, Manufacturing & Exporting (An ISO 9001-2015 Certified company) Company and our International team of consultants providing a wide range of consulting services to Pharmaceutical & allied healthcare industries like Drug Formulation & Bulk Drug (API), Paramedical Herbal Phytochemicals and Neutraceuticals. This team of professionals is well positioned to help you identify and enhance business opportunities in the rapidly growing International markets. ENRICH PHARMA is with well qualified professional people and having experience more than 19 years in the International Industry focusing on critical Pharmaceutical and Biotech industry functions, including India & Overseas markets . Our main aim is to provide extensive action plans with step by step directives for every phase of your export operation to eliminate most missteps and losses including steps for making effective presentations follow-up and closing orders.